I moved from Northern California to the Northwest about 25 years ago, and took with me an established peach tree that had sentimental value. 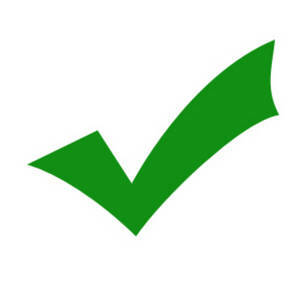 My gardener dug up the tree for me, but said it wouldn’t live by the time the movers set it on their truck……but it did. The movers swore up and down that it would not survive the long cold trip to Seattle in late October……but it did. The tree had to be planted at our rental house and then dug up again the following July and replanted by the landscaper at our new home who said the tree had suffered enough and it was practically dead – and why couldn’t we see that? I asked him to humor me and plant it anyways, which he did all the while grumbling under his breath “this won’t survive” ……but it did. That little peach tree did nothing the first two years – not a single peach (barely had leaves much less fruit.) But in the spring of the third year, it blossomed. And in the fourth year it actually produced a few peaches. Now 20 years after that first peach I get tons of peaches each year – too much to keep up with. I am starting to see less and less peaches as the weeks go by and know that summer is just about over. 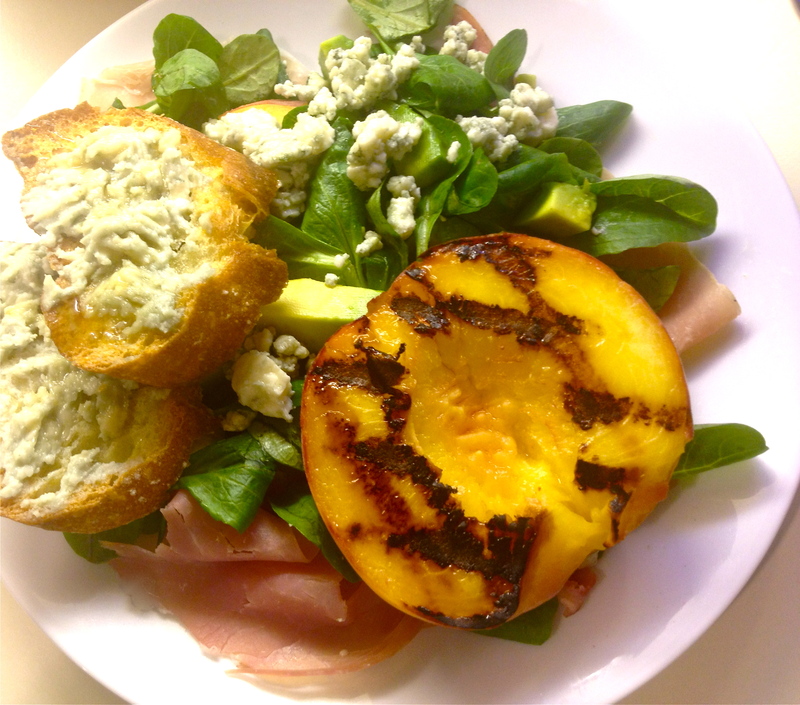 Here is a recipe for grilled stone peach salad for Labor Day. Have a happy and safe holiday weekend! Heat a grill to high (450° to 550°). In a blender, add all dressing ingredients and blend until smooth – set dressing aside. Wash peaches, halve, and remove stone. Add small amount of olive oil to hot grill and add peach halves – grill for about two minutes until grill marks start to appear – then turn over and grill other side. While peaches are grilling, prepare a sheet pan with light covering of olive oil and place baguette slices on pan and into 450 degree oven till brown. Turn over and brown other side. When baguette slices are done, remove from oven and rub each slice with the garlic clove. In a small bowl add 1/2 cup of the gorgonzola and a small amount of olive oil. Mash until smooth and forms a spreadable paste. Then spread on the warm baguette slices and drizzle a touch of honey on top. Set aside. Lay out 4 salad plates and line each one with 3 slices of proscuitto. In medium bowl add the washed Mache lettuce, avocado cubes, and half of the remaining gorgonzola – pour 1/3 of the dressing over the salad and toss well. Arrange the salad over the prosciutto and place a peach half over the greens. Sprinkle with remaining gorgonzola over the four plates and lightly drizzle the remaining dressing over the salad. Add baguettes to the side of the plate and serve. Beautiful salad– and the sour cream with lime in the dressing sounds perfect! Thanks Rhonda – I will miss this salad until next year’s crop. I love the lime with the peaches. What a fresh dish. Thank you. 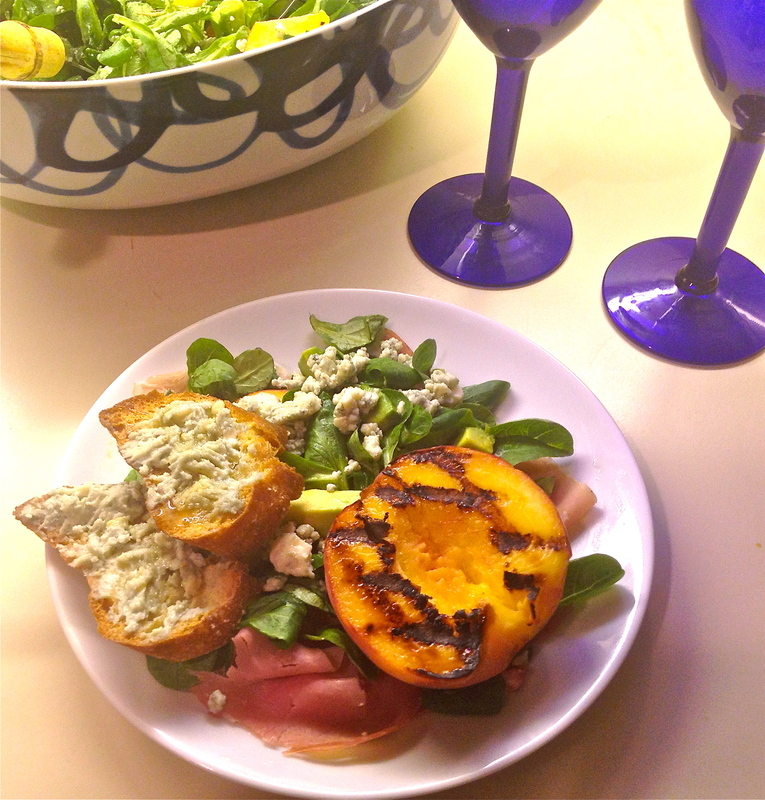 I like the combo of the freshness of the lime and the peaches in contrast to the saltiness of the prosciutto. Love that your peach tree survived, amazing and your salad is lovely. Thanks Suzanne – I always knew it would survive! Miracles do happen. I’m glad that the peach tree survived. I use peach in my savory cooking, and love it being grilled too. This is a simple and gorgeous salad. It’s fun when things work out like they should – thanks Fae!